Made with just a few key ingredients, guacamole can be pretty easy to make at home if you know how to do it. To help you bring your go-to guacamole recipe to the next level, INSIDER asked chefs about some of the best techniques and ingredients that they use when making this popular dish. Although it comes down to personal preference, multiple chefs we spoke to said that the last thing you want is an overblended avocado purée. 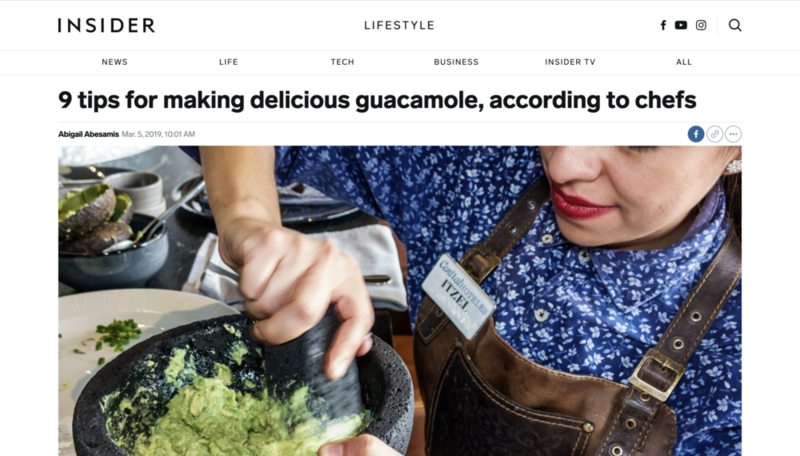 "The trick to our guacamole is we never actually mash it," said Alex Stupak, chef and founder of Empellón, a group of restaurants in New York City that serve modern, upscale Mexican fare. Stupak said that he makes the base of his guacamole by pushing avocados through the grid of a resting rack (a wire rack typically used for cooling cakes and cookies). Then, he folds the newly shaped bits in with his other ingredients. "Avocado flesh has two shades. If you can't perceive both in your finished product, it is overmashed," he added. To make the guacamole at Oxomoco, a New York-based Mexican restaurant, chef Justin Bazdarich said he processes ingredients like Serrano chili, onion, cilantro, lime juice, and salt in a blender before adding them to his avocados. "This way, there's no large chunks or bold flavors, like onion, that could deter the flavor of the avocado," said Bazdarich. Matthew La Rue, founder and chef of Mexican street food hub Taqueria Diana, said making great guacamole starts with top-notch avocados and limes, the latter of which is key for balancing the flavors and keeping things looking and tasting fresh. "Get some lime juice on those avocados as soon as you open them to slow down the oxidization (browning) that happens to the fruit," said La Rue. "[The lime juice] will also keep your guacamole tasting fresher for longer." "For the best guacamole, use orange juice and lime juice together," said chef Julian Rodarte of Beto & Son. "The sweetness of the orange juice balances the bitterness of the lime [and they combine] to make the best tropical citrus flavor." He also said you can add a few drops of sesame oil to your guacamole to "enhance the delicious richness and nuttiness of the avocado." Erling Wu-Bower, chef and co-owner of Pacific Standard Time in Chicago, Illinois, said he tends to use organic avocados when he makes guac because he finds them to be "sweeter and more flavorful" than non-organic varieties. Jordan Andino, chef and owner of Filipino taqueria Flip Sigi, said that you can elevate your guacamole by simply adding a flavor-packed ingredient like charred corn, pickled onions, or Sriracha to it. To achieve a smooth but chunky guacamole texture, Chase Devitt, executive chef and partner at from-scratch, ingredient-driven kitchen BriDer in Denver, Colorado, said he uses a whisk to mash avocados. "Using a whisk makes the avocado mixture partly smooth and partly chunky, so you get the best of both worlds," said Devitt. Miguel Baltazar, executive chef of Thompson Zihuatanejo (a luxe beachfront resort in Mexico), said he uses a Molcajete mortar (a mortar crafted from a specific type of volcanic rock) to grind and combine his recipe ingredients because "the roughness of the volcanic stone gives [the guacamole] a unique, rustic texture." Katy Smith, executive creative chef at Puesto, a Mexican-American eatery, said her recipe for guacamole nogada contains nontraditional ingredients like candied walnuts and pomegranate seeds because they can add flavor and texture to the dish.